Passengers desperate to charge up their phones before flights are falling victim to the joke stickers, which have begun cropping up at terminals across the world. The convincing looking sticky pictures have been placed on walls, bins and even doors, leading travellers to try and unsuccessfully plug their chargers in. The stickers can be bought online from £4.99 for a pack on online sites like eBay and Amazon. 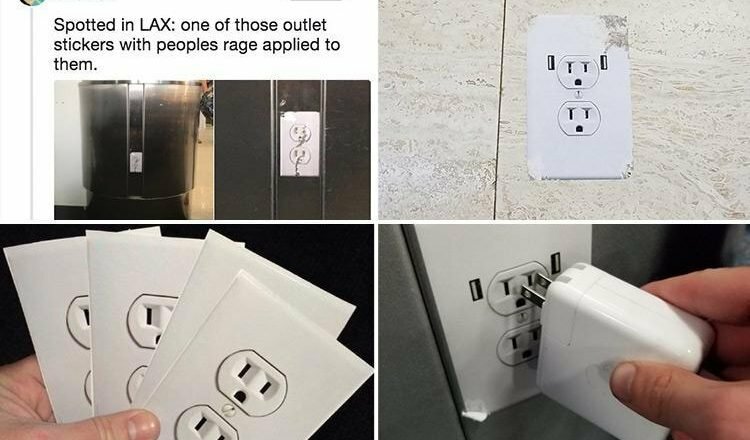 One passenger called Brandon Ewing, who was fooled by the prank, shared a picture on Twitter with the warning: "Whoever put up this fake sticker of an open outlet at the airport, you are now my enemy for life." Another traveller called Alish Erman, who spotted a plug sticker on a bin added: "Will the person who’s putting fake outlet stickers all over the airport please die already thanks." In videos uploaded to Twitter, unsuspecting passengers can be seen trying to slot their chargers into the phoney socket, only to realise a moment too late that the plugs are stuck on. In one clip, a woman strolls up to the sticker and tries to slot her charger in, prompting her to look visibly confused when she gets close enough to realise the socket is a fake. Another video shows a woman trying to use the fake socket she's sat next to, before laughing and looking around with embarrassment when she realises she's been pranked. That's not the only joke people have been playing on each other at airports – one couple have turned their long-distance relationship into a game by embarrassing each other in arrivals with silly signs. Meanwhile, a pilot with a sense of humour went viral earlier this year after pranking passengers by pretending to be blind.